Also See... Help, I Have to Teach Rock and Mineral Identification and I'm Not a Geologist! 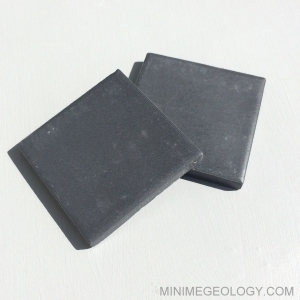 Black porcelain streak plates are great for testing minerals. Often, the color of the mineral's streak is a clue as to the identification of the mineral. To perform the test, rub the mineral on the plate and observe the color. The streak is the color of the mineral in powder form. Many minerals have a streak that is the same as its outward appearance; however, some streaks are very different colors! Black streak plates are great for light colored samples. Each streak plate is 2” x 2”.